Raj Ramayya is an Indo-Canadian singer, composer and lyricist. His claim to anime fame would be his musical collaborations with famed Japanese composer Yoko Kanno as a member of The Seatbelts. 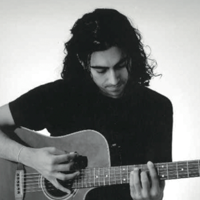 Raj sang the opening credits song “Ask DNA” and wrote the lyrics for “Cosmic Dare (Pretty with a Pistol)” from the fan favourite feature film Cowboy Bebop: the Movie, and both sang and wrote the lyrics for “Strangers” from the anime series Wolf’s Rain. Not limited to music in anime, he has also worked on songs for video games from the likes of Konami, Sega, and Capcom. Raj has been featured as a guest vocalist/composer with several distinguished artists, ranging from talented composers Yoko Kanno (Escaflowne, Cowboy Bebop, Wolf’s Rain) and Tatsuya Oe (Captain Funk, Hotei), to gifted lyricists Chris Mosdell (Eric Clapton, YMO) and Ron Sexsmith, and everyone in-between. His work has won him multiple awards and critical acclaim from around the world. Among his other projects are the electronic Indian fusion music project “Bhang Lassi”, the alternative Indian-influenced folk rock band “The Beautiful Losers”, and session singing for products ranging from Asahi Beer and KFC, to Toyota and Coca-Cola. He is also a guest vocalist with three different Japanese electronic music groups; Captain Funk, Akakage, and Studio Apartment, with SA’s song “Strawberry Rainbow” (which Raj both sung and wrote lyrics for) hitting #1 on the iTunes Japan charts! Raj is excited to be making a triumphant return to Anime Midwest and can’t wait to perform for everyone for the second year! For more information, you can visit him online at http://www.rajramayya.com.